No one really enjoys it. There’s always a feeling that you’re doing it wrong, that it could be better somehow. If you rush the process, you may well come to regret it later. The small problems you think you can live with only become more obvious over time, and bother you more. No, I’m not talking about looking for a romantic partner. I’m talking about something much more important: picking up stitches for buttonbands and edgings. This is the first part of a series on those pesky finishing details. In future columns, I’ll also tackle making buttonholes and attaching buttons. But let’s start where most buttonbands and edgings start: with the pick up. 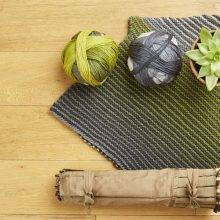 Even the terminology is difficult: we tend to use “pick up” and “pick up and knit” interchangeably, even though they’re not really the same thing. When we say to “just” pick up stitches, we mean to feed the tip of the needle through the edge of the fabric, putting loops from the fabric on the needle. When you’ve got stitches on the needle, you could then join yarn and work across them, but you don’t have to. 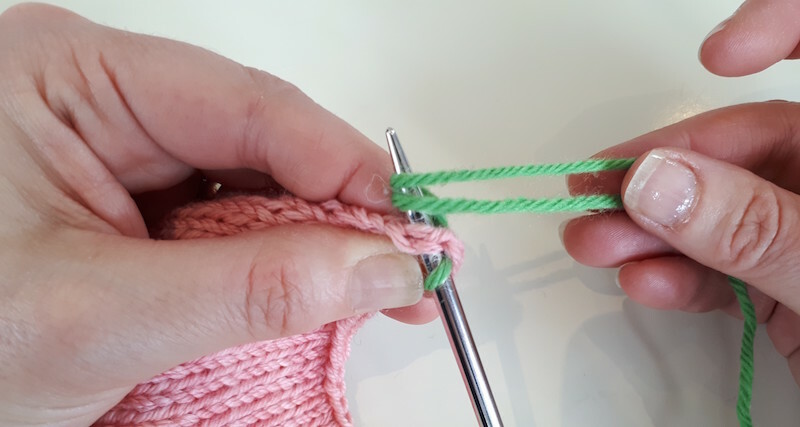 This technique is used in situations where you need loops but no yarn attached: to set up for a three-needle bind off or a Kitchener stitch seam, for example. 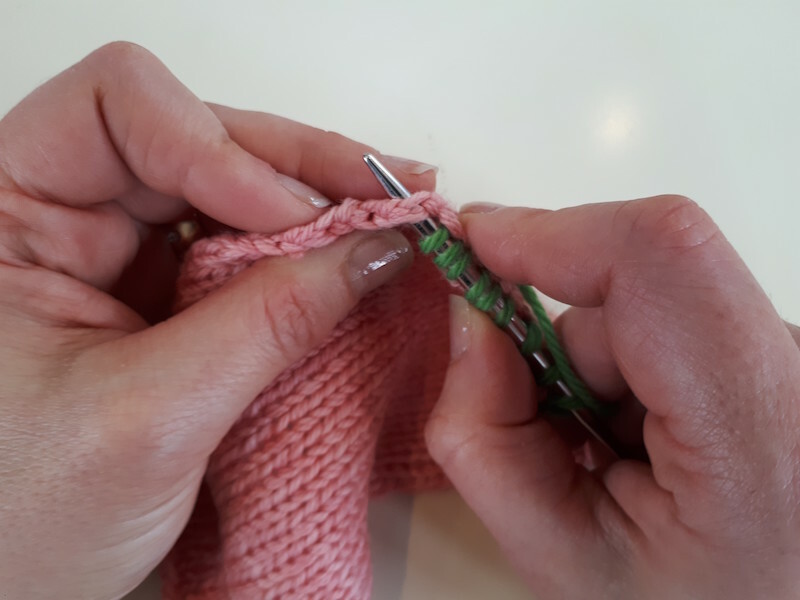 When we say to pick up and knit, we mean to use yarn to “knit up” stitches along the edge. 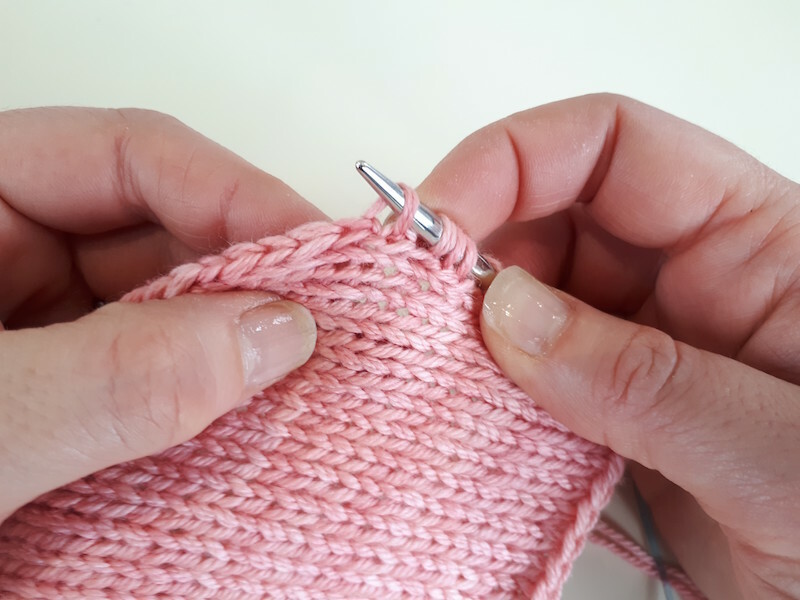 You are to grab the stitch (or some other loop) at the edge of the work with the working needle, wrap the working yarn around it, and pull the yarn through, completing it like a normal stitch. 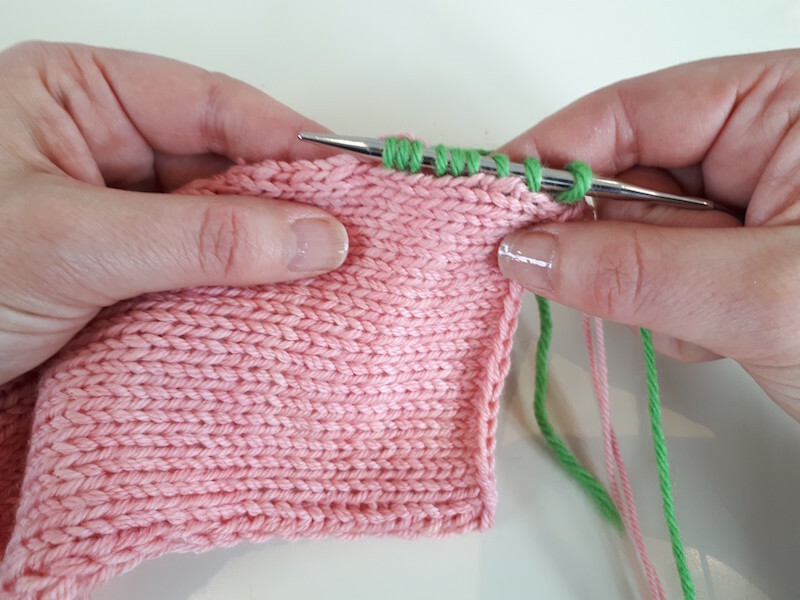 For the first stitch, leaving yourself a decent tail—3 or 4 inches/8-10 cm—just wrap the unattached yarn around the tip of the right-hand needle, and pull that through to create the first stitch. Then, when picking up and knitting the second stitch, wrap both ends of the yarn around the needle. For the third stitch, drop the tail end, and continue with only the working yarn. This anchors the new yarn, in a tidy and low-profile way. 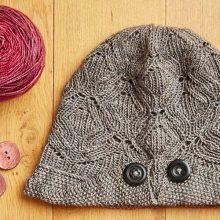 Work both strands of the doubled-yarn stitch together, when you come back to it. 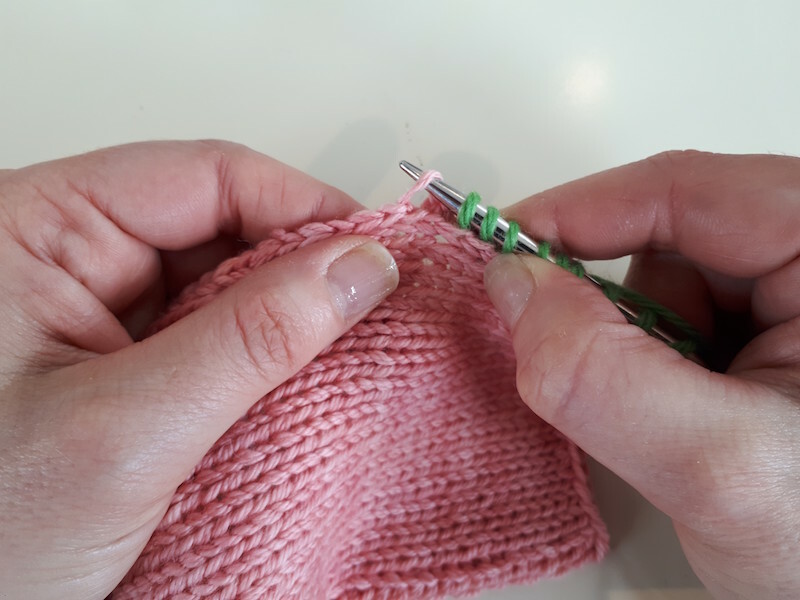 When doing a pick up and knit, I strongly recommend that you pick up the full stitch, both strands of the edge stitch as you work across. It makes for a much tidier join. Picking up only one strand or side of the edge stitch makes for a sloppier edge. At a basic level, these two techniques result in the same thing: new stitches on the needle. If, after picking up (but not knitting) all the way along the edge, you join the yarn and work across the stitches, you end up in the same basic place: new stitches where there weren’t any before. The difference between the two executions is in the edge. If you do the pick-them-all-up-first-and-then-work-across-them method, you’re putting all the stitches/loops of the edge under stress at the same time, requiring them all to stretch to accommodate the needle. If you work the pick-up-one-then-knit-it-before-picking-up-the-next version, then the stress on the edge is reduced—the stitches/loops are only needing to accommodate the yarn. 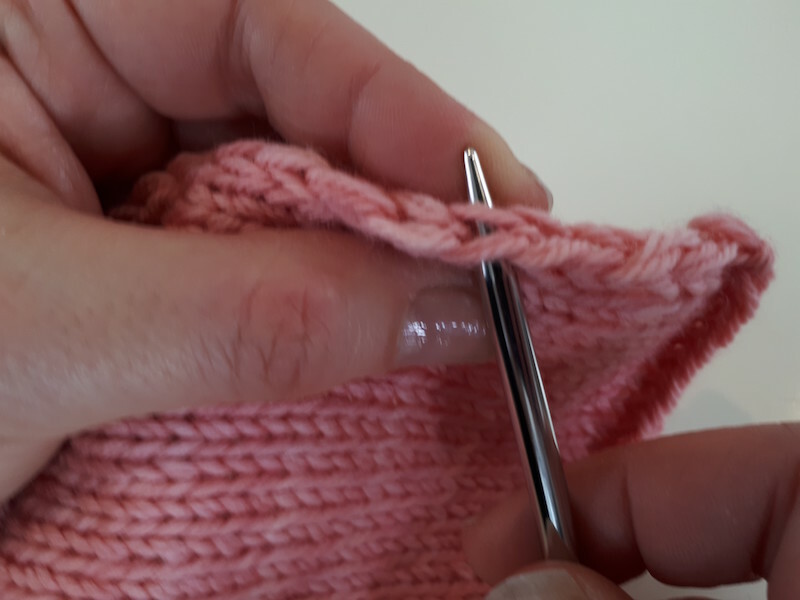 The other difference is where you can put the needle—as noted above, it’s harder to grab both legs of the edge stitch/loop with the first method. Although the imprecision of the language is a challenge, if you see an instruction to either “pick up” or “pick up and knit” without further comment or detail, you can generally assume you should work a pick up and knit. The rest of this article is about that. There are three possible places to pick up stitches: a cast-on or bound-off edge, a side edge, or along an angle or curve. For each, there are two decisions: where to poke the needle, and how often. If working along a cast-on or bound-off edge, “how often” is easy: it’s one for one. You’ll be creating stitches over stitches, so you need one new stitch for every existing stitch on the edge. As to where to poke the needle, it depends on the technique used for the CO and BO. The general intention is to hide the lip/edge. 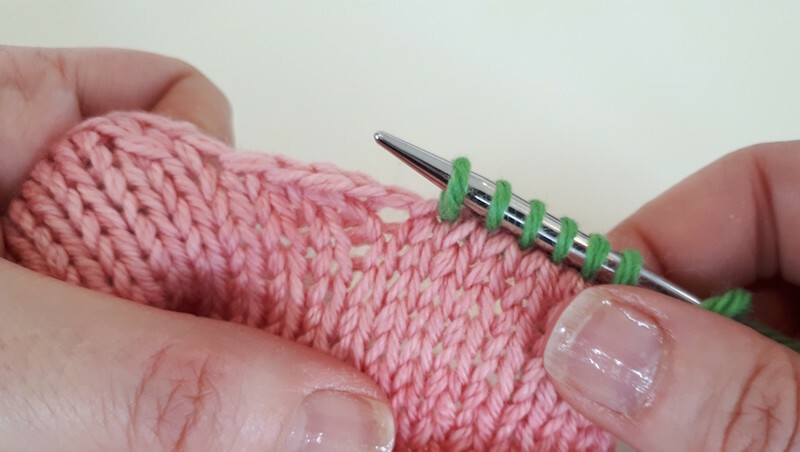 If you are working along an edge created with the standard bind off or the long tail cast on, then poke the needle under both strands of the “stitch” lying on top of the edge. Picking up under a long tail cast-on edge. Picking up under a bound-off edge. If you used a different method, you might not have a tidy lip. Poke the needle through the center of each stitch, in the complete stitch that’s closest to the edge (the first or last row). Picking up under a cable cast-on edge. Picking up along a side edge changes the rate of pick up. Knit fabrics aren’t square: there are more rows than stitches. 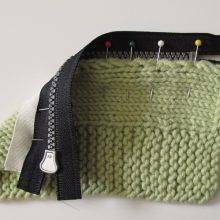 Picking up stitches along the side of a piece of fabric means that you will be working perpendicularly to the fabric, so you need to create stitches over rows, and therefore consider the relationship of the two gauges. A gauge of 18 sts/24 rows has a ratio of 3 to 4; a gauge of 20 sts/28 rows has a ratio of 5 to 7. The ratio tells you how many stitches to pick up over how many rows—in the first example, 3 stitches in 4 rows, in the second 5 stitches in 7 rows. As you work across, you’ll skip loops/stitches on the edge. If using a 3-to-4 ratio, pick up in 3 adjacent rows, and skip the fourth. As to where to poke the needle, this is easy: under both strands of the edge stitch. 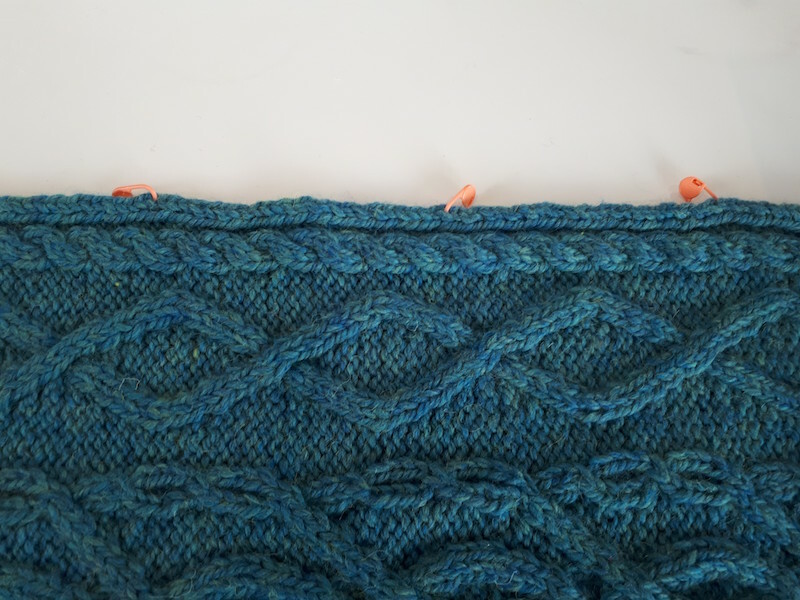 This is where the slipping, or not, of edge stitches becomes a crucial consideration: the short answer is that you need to pay attention to the pattern instructions. If you slip the edge stitches, that means you’re reducing the number of available places for picking up by half. It’s well-nigh impossible to pick up a 3 in 4 ratio, for example, on an edge with slipped stitches. So if the pattern doesn’t tell you to slip, don’t! 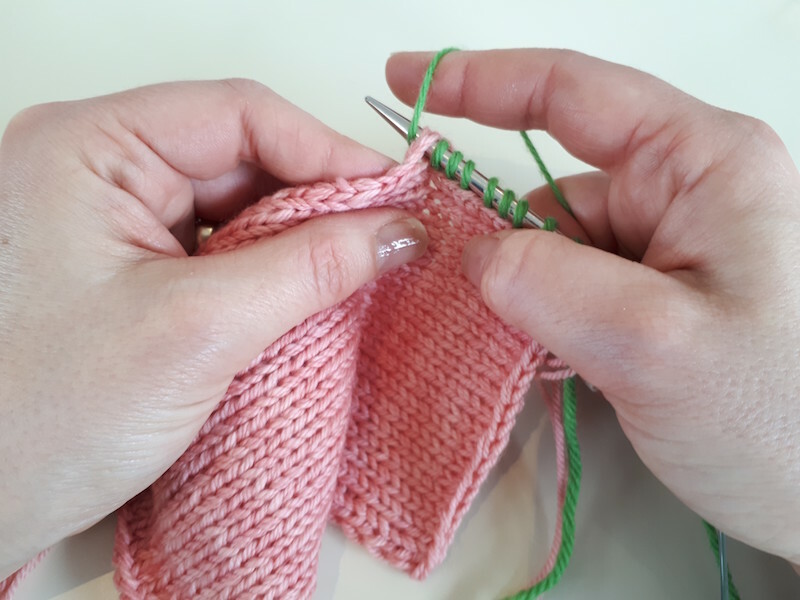 A side note: A top-down sock heel pattern will typically tell you to slip the first stitch of the row in the flap, and then have you pick up one for every slipped stitch along the edge. That means you’re picking up 1 stitch in every 2 rows. This works out because most sock heels are worked with a slipped-stitch pattern (Heel Stitch or Eye of Partridge) that compresses the row vertically, changing the gauge. If working a stockinette stitch heel, you shouldn’t slip that first stitch, and should use a ratio of 3 stitches to 4 rows. And then the challenging one. 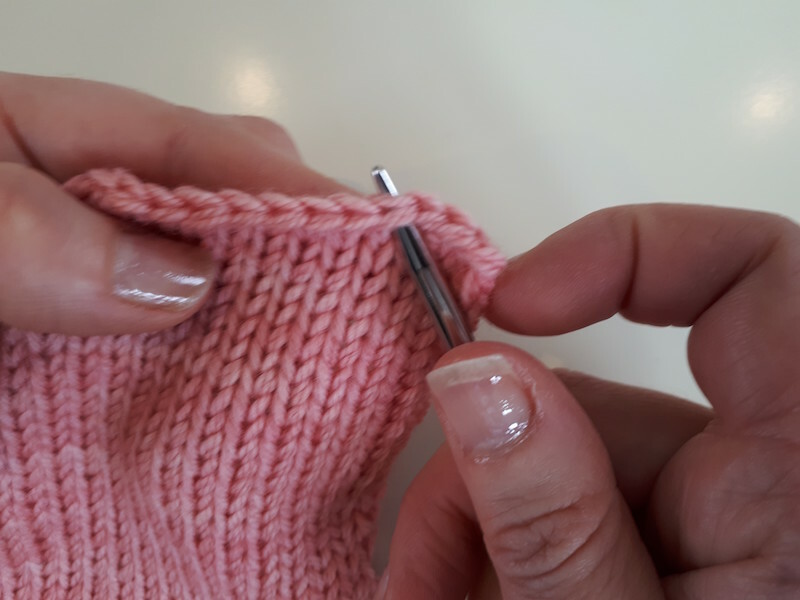 You often have to pick up and knit stitches along edges where there have been decreases and stepped bind offs, such as around the armhole or neckline of a garment. In these circumstances, there’s usually a combination of edges. You’ll probably have a bound-off edge in the center: that’s easy! Deal with that as any bound-off edge. You’ll probably have a straight vertical length. Deal with that as any side edge. Where there’s a diagonal edge, for example, where decreases are worked every RS row, pick up 4 stitches for every 5 rows or so. Really the only tricky bit is in the corners, at the sides of the steps, or in the curves of shaping. If you’re dealing with a stepped bind off, there’s an awfully tempting little hole, at the step. Avoid picking up a stitch in one of these oversized gaps. 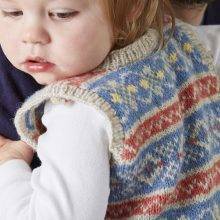 Look for a snugger stitch or smaller gap either side. Resist this tempting little hole. there, Aren’t you glad you resisted? Some patterns tell you how many stitches to pick up along an edge; others use a ratio. If you’re making an adult-size garment, it could be 100 or more stitches. 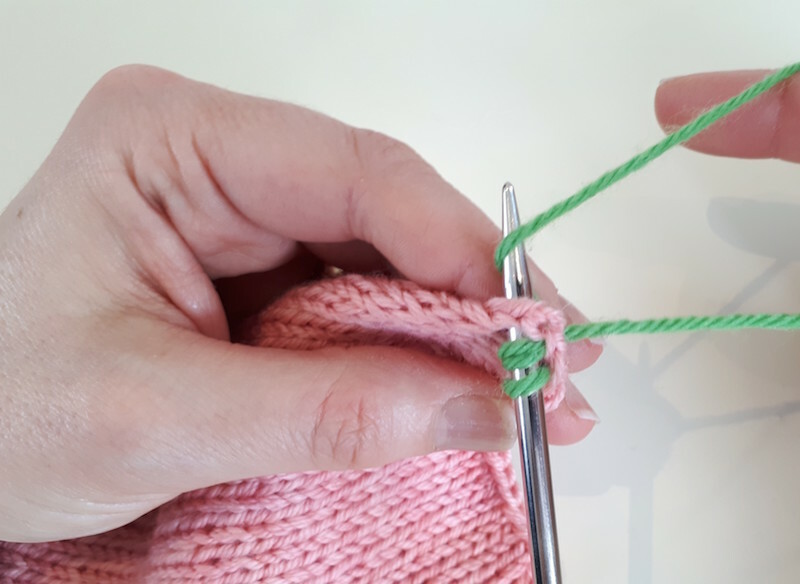 If you’re working to a specific number, removable stitch markers are helpful: subdivide the length into quarters, and use that as guide for how to distribute the new stitches. Picking up stitches is sort of like going to the gym: most don’t like the process, but the results are worthwhile. And if it takes more than one visit to get the result you need, it’s worth persevering. Put another way: if you do the pick up and it doesn’t look good, it’s absolutely worth redoing. After all, these aren’t live stitches, so it’s a painless frog. These types of finishing details make all the difference in how your piece looks: the front edges are right there, front and center. Take an extra few minutes to make sure they look their best. After all, it’s not just others who will see this part of the garment, but you’ll see it every time you look at yourself in the mirror. Make sure you’re proud of your work! Don’t need to pick up stitches right now, but want to find Kate’s wisdom on the subject later? Here’s how to save this article in your MDK account with one click. It feels so good to know how to do things the right way. This was the most intimidating thing to do when I first started knitting garments (still haven’t tackled steeking! ), but each time I do it, it becomes easier…especially after reading really good instructions like these. Now I need to go rip out a rolled collar to reduce the number of stitches picked up so it looks tidier and fits better! This is an excellent article! 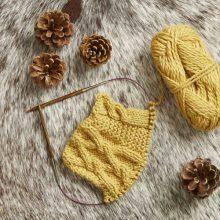 So helpful – my neckband pick up and knits always leave me a bit unhappy. I’ll definitely try to utilize these tips. Excellent article, I’ll be saving this one. As a new knitter, I am having to pick up stitches to do Log Cabining. I am finding it the most “un-fun” part of a very fun process! I am also learning that a very pointy needle makes it much easier to get into those pesky little stitches. Thanks so much for this! 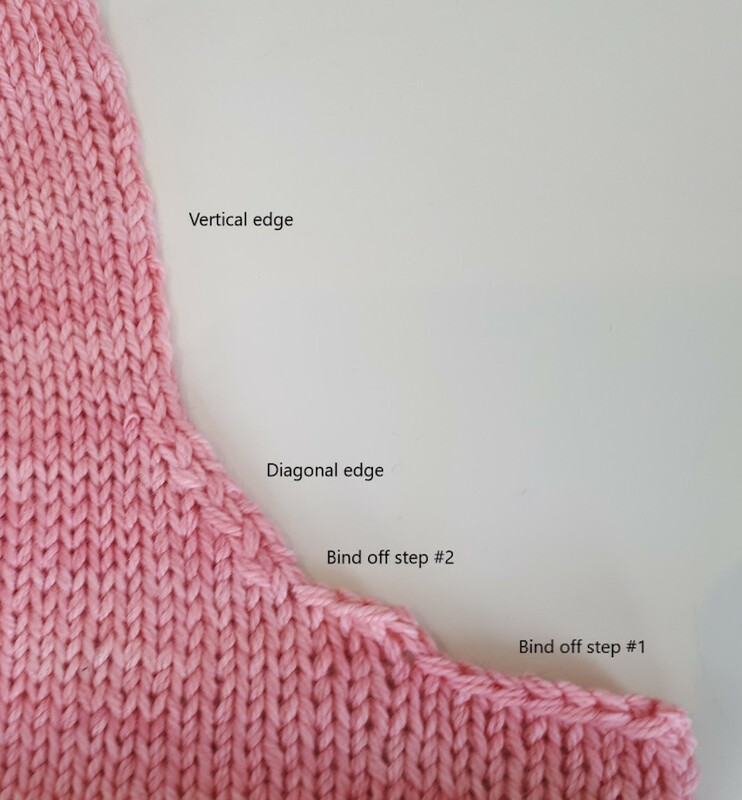 I’ve been knitting socks using the pick up then knit method because I’m afraid of not picking up enough stitches for my gusset, but this has convinced me I’ll be happier with the result if I follow the pattern instruction to pick and knit. Here’s to being brave! It’s alwat the neckline pick up that gets me. This is so helpful! 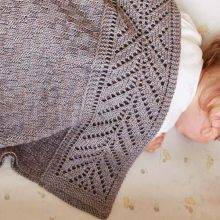 Great article and well worth implementing in your knitting! Great article. And such an easy way to get that ratio. Looking forward to more! I woke up this morning thinking about the 130 stitches I needed to pick up to finish the neck of my sweater. Would I be able to do a quality job? Thanks for the clear calm detail and reassurance! As I am about to embark upon picking up and knitting an enormous number of stitches on my version of the Summer Fairy tunic I remain eternally grateful for this oh so thorough post. I’m not a beginner, but sometimes feel like one when slogging through pick up and knits. Merci, merci, merci! I think I should frame this article!! I try hard to avoid patterns where you have to “pick up” stitches. Now, maybe not so much. Thank you. Thank you! 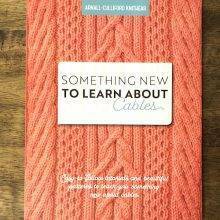 Even after knitting for ten plus years it’s still a chore and often a mystery.This is clear and so helpful. Thank You! This post had the perfect timing! I’m about to pick up stitches for a baby sweater. I’ve never really minded picking up stitches except the diagonal part of the neck edge is the most visible and the most tricky. Thanks for the tips and refresher on picking up stitches. I will also keep this article for future reference. It’s a good one to keep! Your article makes me want to dig out my unfinished Alber’s Cowl and get it back on the needles. Thanks. I am sure I will refer to it many times, especially when I tackle the Fingerless Log Cabin Mitts from the recent KAL. I am hoping to make four pairs for my girls weekend next January. Wonderful article! Loved the clear photos and supportive approach. Am I the only one who thought that “pick up and knit” on an edge meant you pick up one stitch with new yarn and then actually knit it before moving on to the next stitch? It sure would have been easier to pick up all the stitches and _then_ knit them! Margaret, I believe I get what you are saying here. And no, you are not the only one to ever think that. I used to do it just the way you describe. Maybe this could be our secret handshake. Judy, I believe Margaret is describing a sort of three step process. Pick up and knit, just as described by Kate, but additionally knitting again each stitch just after it is first knitted a la the article. Maybe don’t try this at home, kids. 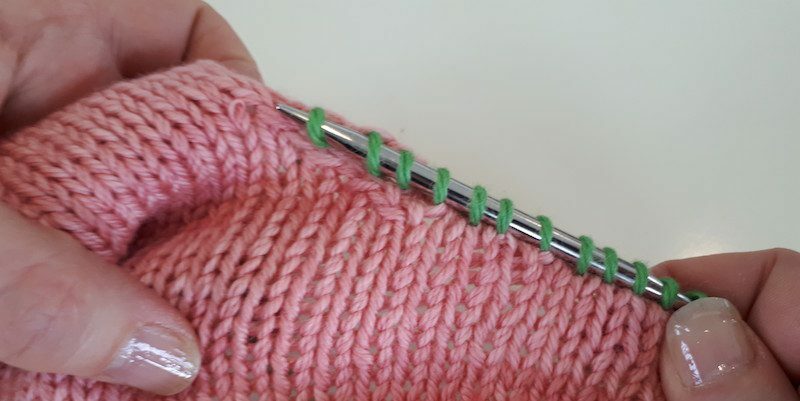 I also encountered “pick up and knit” in a pattern recently, and since I have been picking up and knitting whenever it says to pick up stitches my entire 16 years of knitting, I was very confused about knitting the stitch a second time, and opted for my neater and inadvertently correct method. 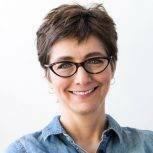 Once again, Kate Atherley is the voice of knitting reason. I am bookmarking this article so I can reference it forever!! Thank you! 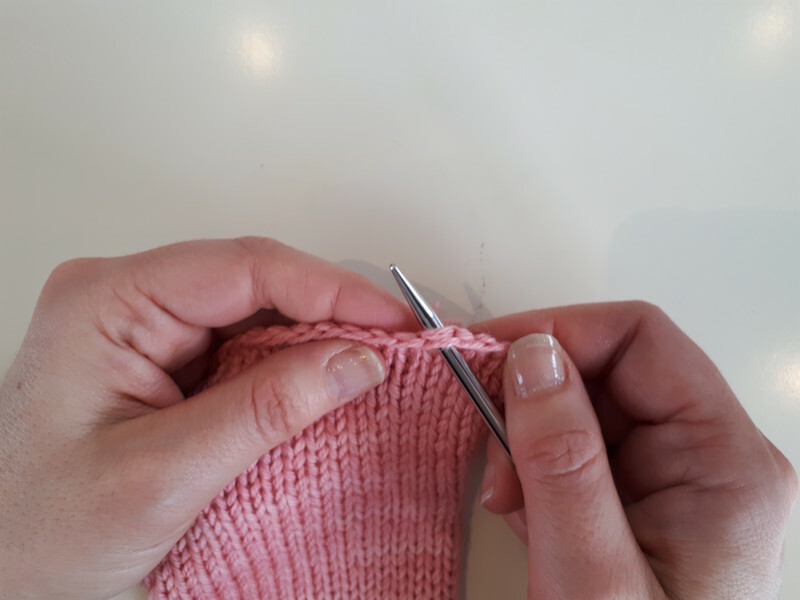 After knitting anything more than three together through the back loop, picking up stitches is my next least favorite (and most stressful) thing to do when knitting – THANK YOU for this! 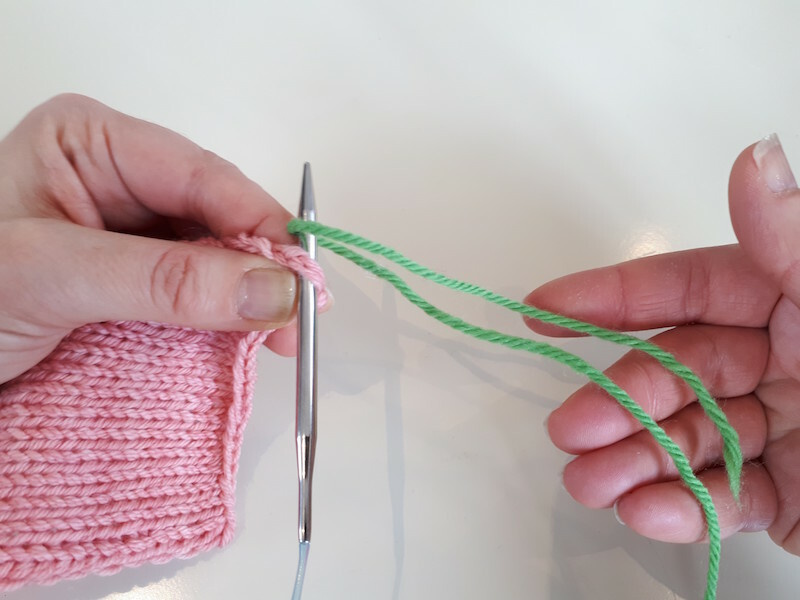 Even the term “pick up and knit” always perplexed me because to me, you’re not exactly knitting when you join with yarn, you’re more making a loop. I get it now. And specifying to not pick up that hole? I needed that because I always go for it, and then end up with a bigger hole. Excellent post, and again, thanks! I cracked up when I first read Kate’s title for that picture: tempting_little_hole.jpg. It’s so validating to know that I’m not the only one who falls for that hole! Thank you for this and all your other how to’s! I knit but self taught and glad to have this and your others to help me more. Kate does an amazing job explaining this process. I love picking up stitches, but I always for that easy hole and this is an excellent reminder! This is a keeper. Thank you so much! I really appreciate this info!! I always come up short on my pickups while making socks. I knew about the how-to…..Grandma… But the count made me crazy! My Gran would have loved this site. Clear, concise and so helpful. I look forward to these great newsletters and ideas. Thank you! This article came just when I was considering using the technique on the project I am currently working on and I can now adopt the tips to produce a much tidier work. I am glad to know there is a place (here) I can go to in about a week when I put the button band on a sweater I am about to finish. Wonderfully useful article. Thank you! 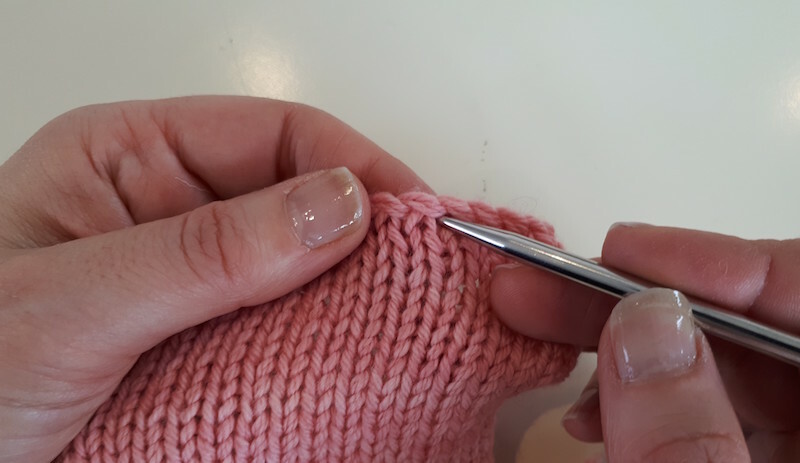 I’ve always used the “Dirty Little Secret” technique, because after an arduous effort to pick up stitches around an edge, I ALWAYS had the wrong number no matter how careful I was. Until today, I thought of it as cheating; now I know that it’s actually a master knitter technique! Guilt-free knitting! Kate:you’ve changed my life! All my picking up problems (and there have been many) solved in one amazing tutorial. Thank you! I kind of enjoy picking up stitches, because I like the chance to change the direction of the knitting, and it usually comes at the end of a large project. Exciting! Great tips in here, I especially like the one about calculating your pick-up rate. I am pretty sure that picking up stitches will continue to be my least favorite thing in knitting but am hopeful that I will do less frogging now (which means less time picking up the same wretched stitches over and over again until I like the way it looks and get exactly the required number of stitches!). Thank you so much for this. The tip on the hole is also appreciated as I am pretty sure I have done this. More than once. Probably every time there is a hole available to dig the needle through. I am a repentant recovering serial hole knitter now. Very clear and concise. Thank you. Thank you for this. I have always had trouble picking up stitches and this is the year I’m going to learn how to do it properly, so i don’t have garments sitting in wait for button bands. This will help me on my way! THANK YOU THANK YOU THANK YOU!!! I mostly try to avoid patterns with button-band pick-ups, but after this I feel like a Knitting Warrior, ready with needles in hand to tackle all of them. I wish Kate was my next door neighbor. She makes it all feel possible. This is explained very well! Thank you! A perfect tutorial. I’d like to cast my vote for Kate (not to mention Ann and Kay!) as Living National Treasures. Many thanks for your terrific tutorial. Kudos to MDK! AW, this is so nice, Rebecca. As Kate lives in Canada, she can be a Living National Treasure up there, too! I think maybe she could even get knighted or damed at some point. Dame Kate Atherley has a nice ring to it. When I do pick up and knit the stitches are twisted in the wrong direction. When I knit the new stitches I knit into the front leg which creates a twisted stitch but has the advantage of being a tighter stitch. This seems preferable to me for situations like button bands that get a lot of wear. Am I doing something wrong? Is there a way to have the stitch oriented the correct way? Right now my focus is knitting for my very young grand children. Your article on how to pick up stitches was perfect timing. Thanks so much and now that I have found you i will follow your site. Super helpful information here. It seems no matter what I do my picked up stitches on my heel flap are gappy. Now I know why! And the ratio thing for how many to pick up…brilliant tidbit. Thank you Kate! Wonderful article! I’m always picking up and then ripping back. This gave me an understanding of the ratio to use on my next project. Many thanks, I’m in agreement this article is a keeper. Such clear instructions! Thank you! When I pick up and knit, I use a crochet hook to do the picking up part. It makes it easy to pick up both loops of a stitch, then I transfer the stitch to my knitting needle. Oh, the timing!!! I was just about to start the front band on my Carbeth Cardigan and remembered reading about picking up stitches! Thank you!! !